NAFLD is the hepatic manifestation of metabolic syndrome [3, 4]. Patients with NAFLD have a higher risk of cardiovascular mortality than those without NAFLD . Chronic low-grade inflammation mediated by macrophages is a common factor involved in the pathogenesis of a collection of metabolic pathologies, including insulin resistance, NAFLD, atherosclerosis, and dyslipidemia [6–8]. 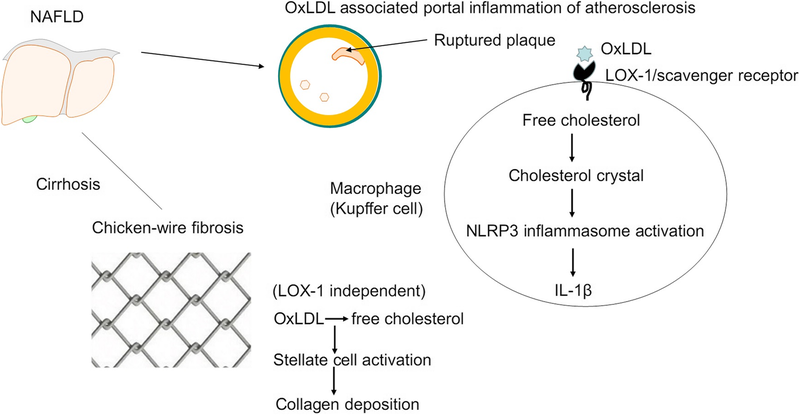 Specifically, macrophage activation mediated by lipid metabolites, such as oxidized lipoproteins, free fatty acids, free (unesterified) cholesterol, and ceramides, represents a common pathogenic lipotoxic mechanism . Immunostaining of the hepatic microenvironment was evaluated and compared in serial sections. Liver specimens from a recipient with propionic acidemia and those from a healthy living donor were used as controls. α-SMA-positive cells were considered as vascular smooth muscle cells if they were located in the vascular walls or as activated stellate cells if they were located elsewhere and without CD31 on the adjacent endothelial cell surface. CD68-positive cells were considered as macrophages. 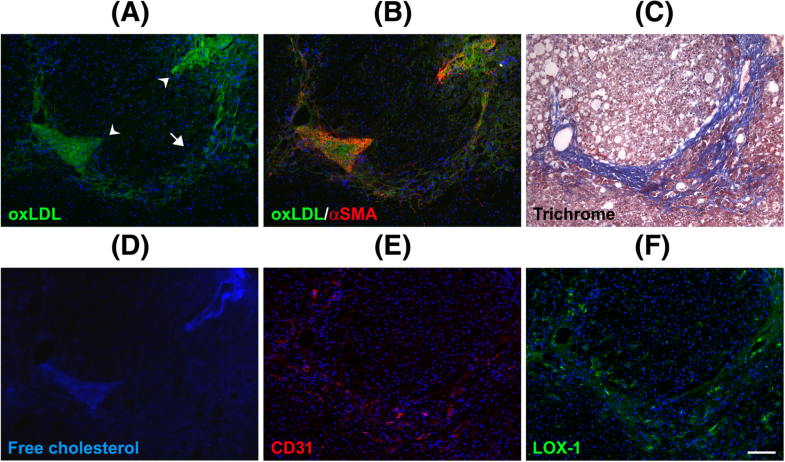 LOX-1 has been established to be expressed in vascular endothelial and smooth muscle cells and implicated in endothelial dysfunction and atherosclerosis [25, 26]. Moreover, it is expressed in activated macrophages in the proinflammatory microenviroment [27–29]. Irregularly stained expression pattern of vessels suggested vascular damage . In addition to the expression of IL-1β, the induced expression of LOX-1 beyond that in the control tissue was considered a sign of inflammation . Fibrosis was validated through Masson’s trichrome staining. Free cholesterol was identified through filipin staining. At least 5 portal venous regions were examined. 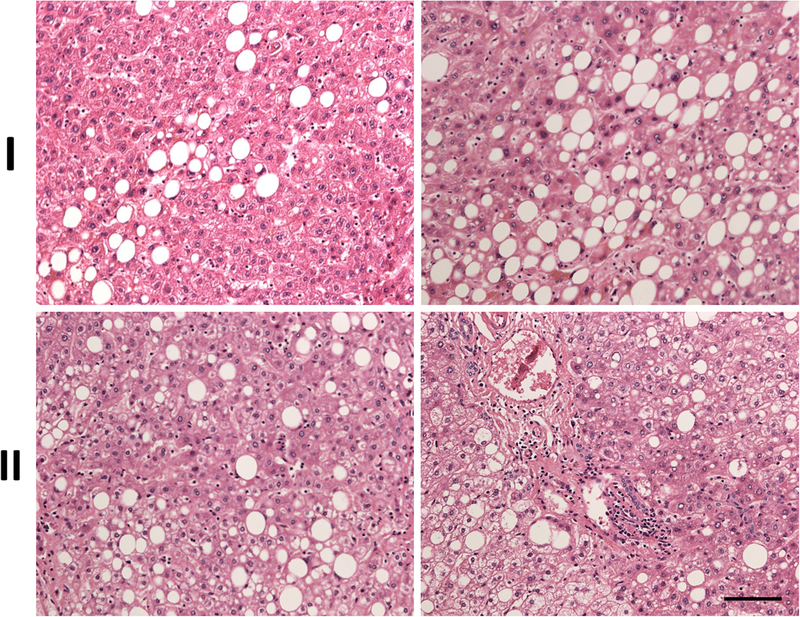 Liver tissues from a pediatric patient with propionic acidemia (Additional file 2: Figure S1A) and those from a living adult donor (Additional file 2: Figure S1B) with a pathological diagnosis of mild fatty liver (5%) were used as the comparative control.